At the moment, we have our very first international guests. Our first out of town guests to our place really, as when our friend Ashlei visited from Seattle in December, we were still living in the temporary place, and not feeling quite so settled. 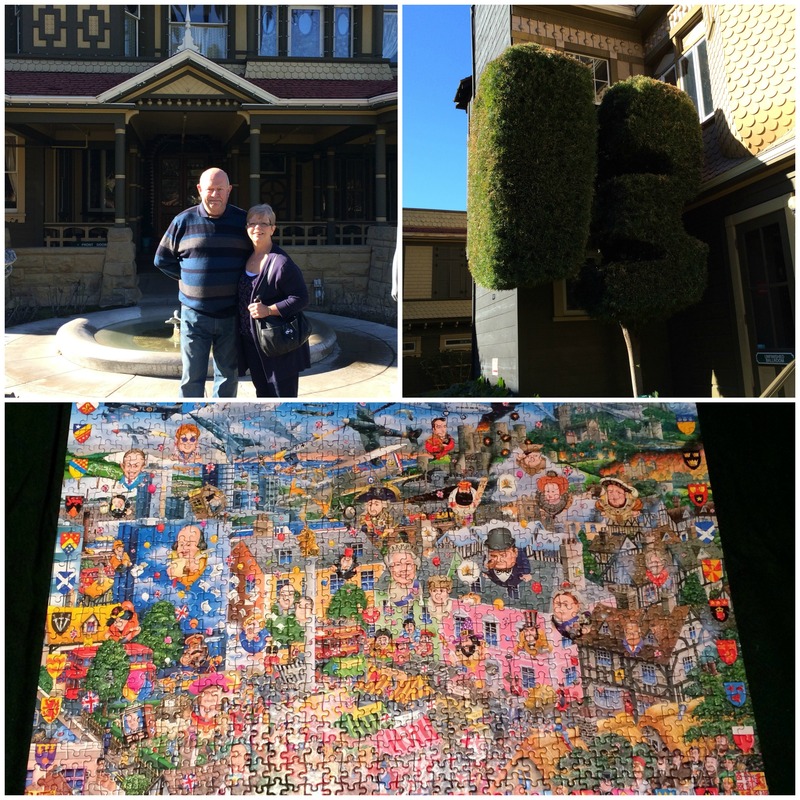 Anyhow, my Mum and her husband Jim are here to visit, and we have been to the Winchester Mystery House, the Mountain View Farmer’s Market, and…… of course, completed a jigsaw. A very British one. After we went to the Winchester Mystery House, we stopped in at Santana Row for lunch, and of course ended up wandering into Sur La Table, and I finally took the plunge and bought a Bundt tin (it’s a Heritage Nordicware one), after debating it for about a bazillion years (Sisley kept posting really exciting looking picture of beautiful Bundt cakes)…… and then I had to try it out, by using it to make this Bundt cake recipe that I have had for years, but have only ever made it in a tube pan! Odd story behind this recipe, as I found it online the aforementioned years ago, didn’t write down where from, but have a feeling it was from Jane Green‘s blog (the writer). It isn’t on there anymore, nor can I find it anywhere else. Similar recipes, but not quite the same, so I have posted it here, including my conversions. I added the melted chocolate, which gave it a hint of chocolateyness (yes, that is a word…ish), but actually I would perhaps substitute some cocoa powder for some of the flour, maybe about 50g, to give it an extra dose of chocolate. 2 cups (16oz/450g) sugar NB: Mum had been making a fruit salad, and zested the orange before using the flesh for the salad, I added the zest to the sugar to help add a little more orange flavour. Preheat the oven to 180C/350F. Grease Bundt pan. NB: I sprayed mine with oil, then gave it a light dusting of flour, it came out no bother at all. Place orange in a bowl and cover with cling film. Microwave for 5 minutes on high power, then allow to cool slightly before pureeing in a blender. Sift together flour, baking powder, and salt in a bowl. In a separate bowl, cream together butter and sugar until light a fluffy. Add the eggs one by one, mixing between each. Add orange puree to milk. Add flour mix and orange mix alternatively to creamed butter, beating until combined. Bake for 1 hour, inserting a skewer to check it is done (the skewer should emerge clean). Then allow to cool slightly before turning out of the pan. To make the glaze, combine the ingredients in a saucepan and heat until the butter is melted, and the sugar dissolved. Then bring to a boil and heat until is has turned thick and syrupy. NB. I just melted some more chocolate and got drizzly! Oh and Happy Birthday Mum!